Mat Depot makes the best chair mats on the market. Our products provide long lasting protection for high-pile carpets with up to IåÓ thick including padding. They are great for heavy-duty use in the home and office. The lightly pebbled design offers you one of the smoothest rolling experiences you need to move freely while reducing leg fatigue at the same time. Multiple sizes are available in beveled or non-beveled models. See bullets and images for more details. LIFETIME WARRANTY AGAINST CRACKING AND DEFECTS Cheap, discounted mats can be a poor investment. Each brand new mat comes defect-free with a guarantee of high-performance and durability for an affordable price. STAYS IN PLACE Molded cleats prevent mats from sliding around on your floors and carpets while you roll your chair on top of a smooth surface. EASE OF MOVEMENT The lightly pebbled design offers you one of the smoothest rolling experiences you need to allow you to move freely while reducing leg fatigue at the same time. 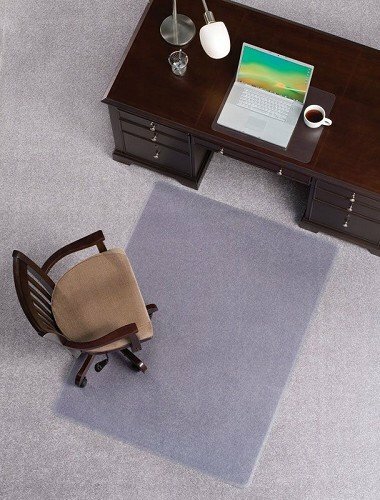 LASTING PROTECTION Protects low-pile carpets, such as loop or berber up to 1" thick including padding; great for moderate use in home and office. SELECT YOUR PERFECT SIZE Available in different dimensions with beveled or non-beveled edges. View More In Carpet Chair Mats. If you have any questions about this product by Mat Depot, contact us by completing and submitting the form below. If you are looking for a specif part number, please include it with your message. Chair Mats 72" x 72" without Lip for Carpeted Floors - Premium Thickness 1/5"